Frances Binnington is an artist who specializes in the ancient art of gilding on glass. She lectures and teaches classes internationally, exhibits her work and works to commission. Her work has been purchased by the Victoria & Albert Museum in London, and the Corning Museum of Glass in the United States. 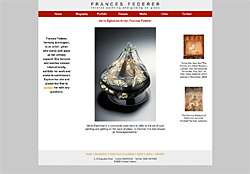 Frances uses the Web site to showcase her beautiful work, and provide information about upcoming lectures, demonstrations, and classes.